ALLeGRO! Toastmasters Floating Academy is a training event organized on behalf of Districts 109 and 59. It aims at fostering the growth of members, but also of clubs, areas and divisions by providing them with the tools they need to plan for success, reinforce individual leadership growth and promote teamwork…. with FUNThe Toastmasters Academy will cover leadership development topics such as time management, conflict resolution, delegation, and leadership opportunities. A training session will be organized specifically for club officers, who will be able to validate their participation towards the DCP. Workshops in different languages will be organized depending on the number of participants and interest. 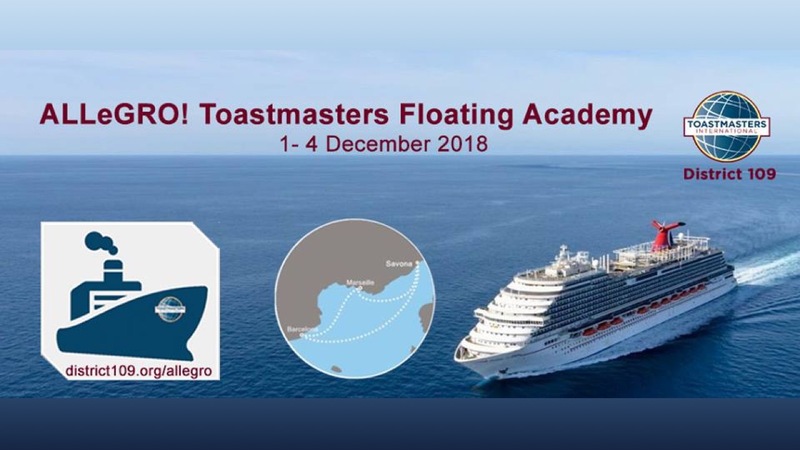 Join us for this special opportunity to learn and have fun on a cruise ship with other Toastmasters from all over Europe. This years District conference will be special! There will be two districts coming together for one conference in Athens. Members from whole Europe will be expected to be part of this historical moment for Toastmasters Europe. It is about the story of European Toastmaster’ joint efforts – that after almost 40 years of spreading communication and leadership skills across Continental Europe – will now get reborn through six new districts! It is about the stories of over 800 excited members from 28 countries that will share their unique multicultural diversity that unite us all under one common cause, the love for being better communicators! It is about the Greek history of reviving the values of ancient rhetoric back to its birthplace! It is about YOU being part of the greatest Toastmasters District conference ever, in One City of Never Ending Stories! Toastmasters District 59 Fall Conference: three days full of humorous speech contests, impromptu speeches and interesting workshops await you. Take a look at the agenda and at the beautiful venue for the Gala Dinner: delicious Italian food surrounded by art and history. What could be better?Don’t miss the opportunity to take a couple of days off to discover the hidden beauty of Milan. A conference is an opportunity to network, to learn (as an audience, as a contestant, as a role taker, as a workshop organizer or workshop participant), and to have fun. This workshop is open for all Toastmasters Clubs in Basel and also for guests. To have a well-crafted story that positions you as a convincing presenter has never been more important. In this workshop you will learn about an anecdotal story building system to design, develop and deliver a story. The workshop was held by Miao Gerhard.